The onboard camera in an iPhone is great for taking casual photos for Facebook and Instagram posts, but even as it gets better and better with each new iteration, it still bumps up against the limitations of its small sensor. So what can you do if you want to break through the mobile photography barrier without breaking the “mobile” part? The DxO One is a good place to start. It turns your iPhone into an advanced enthusiast-level compact camera. But with a price of $499, is the gadget a worthy investment for iPhoneographers? Read our DxO One review to find out. This review has been updated by Daven Mathies to include updated information on new features, and how they affect performance. The camera has also been retested. If you aren’t familiar with the DxO name, know that the French company is renowned for its imaging software and camera and lens benchmarks (including smartphone ratings). Its lab tests are often cited by manufacturers when they tout image quality. (Coincidentally, the new iPhone 8 just received DxO’s highest-ever score for a phone camera). The DxO One is the company’s first hardware product, which makes it all the more impressive. Unlike add-on lenses that simply provide a different field-of-view, the DxO One is a separate camera altogether with its own lens and sensor. It simply uses your phone for control, framing, and sharing. Images can be saved either to your phone or to a MicroSD card in the DxO One (or both). The DxO One might be the ultimate photographic accessory for your iPhone, if you can afford it: The DxO One launched at $599, and while we are glad to see the price has dropped, $499 is still steep for the average user. The Sony back-illuminated 1-inch sensor is a prominent feature that’s used in many enthusiast cameras. The DxO One is essentially a standalone camera that foregoes a monitor and most controls in order to be as compact as possible, relying on your phone to be both the viewfinder and control interface. The device connects directly to the Lightning port of your iPhone or iPad (DxO doesn’t recommend using it with an iPod Touch), but it has its own internal battery. To state the obvious, the DxO One will not work with non-iOS devices due to the Lightning connector requirement. As the camera also offers Wi-Fi connectivity (a feature that arrived by surprise after the camera’s launch), it would theoretically be possible to use it wirelessly with a non-iOS device, but DxO has not announced plans to support Android or other mobile operating systems at this time. Plus the direct hardwired connection is part of what makes the DxO One so great: It’s significantly faster than cameras using Wi-Fi. Despite its petite frame, the DxO one packs a punch on the inside. A 1-inch, 20.2-megapixel sensor records images with significantly more detail than the iPhone’s built-in camera. This is the same sensor format that is popular in advanced compact cameras like the Sony RX100 series. Being based on an older version of the tech, the DxO One is limited to 1080p video at 30 frames per second, compared to the 4K video offered in the latest Sony RX100 V.
In front of that sensor is a 32mm (full-frame equivalent) f/1.8 lens. Combined, the sensor and lens pairing is able to take in much more light than the standard iPhone camera, which leads to better image quality and is particularly beneficial in low light scenes. The DxO One app allows full manual control over exposure settings for those who want it, but also offers a simple point-and-shoot automatic mode. The camera can even shoot in RAW and, thanks to another recent firmware update, RAW files can be saved and edited right on your iPhone in apps like Adobe Lightroom Mobile. A USB port — hidden behind a tiny door that also covers the memory card slot — is used for recharging or transferring images to a computer. There are only two physical controls on the camera itself. First, there’s the lens cover, which slides down to reveal the lens and turn the device on. Press it all the way down to open the Lightning connector; the lens cover will then spring back into the on position. Other than that, there is a shutter button on the top of the camera that works just like that of any standalone camera. It doesn’t get any simpler than that. We love the concept, software, convenience, and results. Now, even though the DxO One only works with iDevices, you can use it on its own in standalone mode. The little monochrome LCD, normally reserved for showing camera settings, even shows a live preview of the image in an adorably retro looking way. You’ll still want to connect it to your phone (either via Wi-Fi or to the Lightning port) if you want to have any sort of control, but standalone mode is nice if you just need to take a quick snapshot. One thing we really appreciate is that, despite the small size of the Lightning connector, the connection is sturdy. You can twist the camera up or down to adjust the shooting angle, and you don’t have to worry about it coming unplugged. The connector is designed to breakaway safely if too much pressure is applied, ensuring that you don’t damage the port on your phone. We do have one small detail to nitpick here, however: Closing the Lightning connector requires you to again press the lens cover all way down. Because the cover is spring-loaded, this basically requires two hands, one to hold the cover down and the other to press the Lightning connector in. For a camera with an otherwise perfect interface, this feels a bit counterintuitive. 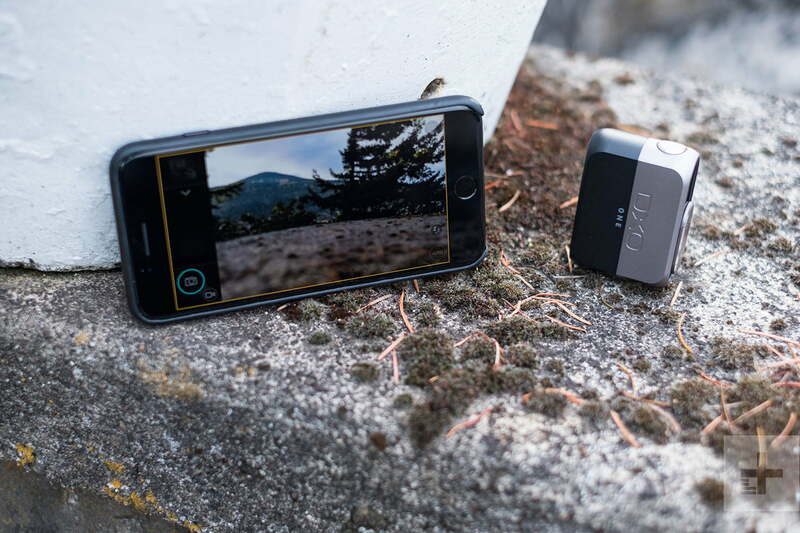 The DxO One has the best software and user interface of any connected camera we’ve reviewed, a very pleasant surprise for the first piece of hardware produced by the company. Even the first version of the app was elegant and simple, and it’s only gotten better. We wish every camera maker would study this device and then try to emulate DxO’s user experience. Everything just works like you’d expect it to, from how the unit attaches to your phone to how exposure adjustments are made with simple using swipes on the touchscreen. Given this well-designed system, shooting with the DxO One is simple. We used it with an iPad Air, iPad Mini 3, and both an iPhone 6 and iPhone 7 Plus. Although we loved the huge 10-inch viewfinder of the iPad Air, it’s rather awkward to use and tablet photography still feels dorky, even with a real camera attached. It clearly feels much better on an iPhone. One of the great things about the DxO One is its small size. You can easily carry the DxO One in your pocket, connect it to your phone when needed, fire up the app, and grab 20.2MP. The app launches very quickly and the live preview basically loads instantly, which means working with the DxO One really isn’t any slower than working with the iPhone’s native camera and app. Along with basic auto exposure, there are options for program, aperture priority, shutter priority, and full manual. Along with basic auto exposure, there are options for program, aperture priority, shutter priority, and full manual. Top electronic shutter speed is 1/20,000th of a second and maximum ISO is 51,200 — very good specs for an enthusiast camera, let alone an iPhone accessory . It is not perfect, though. While the DxO One is good for static subjects such as landscapes and portraits, it doesn’t handle fast action since its top continuous speed is just 1 fps. Autofocus performance, while decent, is also not fast enough to capture a split-second moment. We certainly appreciate that the camera can be used over Wi-Fi now, which opens new creative opportunities, but you’ll definitely want to keep it plugged in to your iPhone whenever possible. Wi-Fi performance simply isn’t up to par, and while preview lag is minimal, the image does stutter from time to time. Furthermore, image transfer time after taking a photo is considerably longer, which also means your shot to shot time increases. Wi-Fi is a nice feature to have, no doubt, but it’s the hardwired connection that gives the DxO One a best-in-class user experience. If you’ve ever shot a Sony RX100 or other advanced point-and-shoot with a 1-inch sensor, then you know just how good the image quality is. It is no different from the DxO One. Colors are vibrant, detail is rich, and dynamic range is greatly improved over the stock iPhone camera (that is, the ability of the camera to capture detail from shadows to highlights). The 32mm lens is much larger and higher quality than the iPhone’s, and the f/1.8 aperture even allows for a relatively shallow depth of field without the drawbacks of Portrait Mode on dual-lens iPhones. It’s not quite at DSLR level, but it’s a huge improvement over the built-in camera. The DxO One a winner for amateurs and serious photographers alike. For high-ISO shooting, DxO recommends shooting in its proprietary SuperRAW format, which takes four exposures and merges them in software for improved noise performance. We tested it at the highest ISO possible — 51,200 — and while the unprocessed file was a mess, it was quite good after we ran it through DxO software. JPEGs are another story; we wouldn’t push those above ISO 3,200, although they definitely still look better than the stock iPhone camera. There are some other limitations. The DxO One only offers electronic image stabilization when recording videos, but not stills. This results in a pretty severe crop in video mode. Also, if you need a flash, you’re stuck with the one in your iOS device as the DxO One doesn’t have one of its own. Thankfully, the f/1.8 lens coupled with the SuperRAW format makes it possible to take photos in very low light (provided you use a tripod or set the camera on another stable surface). DxO offers a basic one-year warranty. Although we love the concept, software, convenience, and results of the DxO One, it is expensive. It is also restricted to iOS only, at least for now. For the same price, you can get the original RX100 with a 3x Zeiss optical zoom lens and even greater camera controls, or a Canon PowerShot G9 X with a 1-inch sensor and built-in Wi-Fi. But if you feel that the convenience is worth the cost for a highly capable camera that you can easily stash in a pocket, one with a great user interface and painless image sharing, than the DxO One is a great iPhone accessory. If you’re a photographer who wants a companion camera for sharing purposes, it is an attractive alternative to bulkier products, and DxO’s software and interface simply can’t be beat. However, it definitely falls into the niche category. There have been other attempts to turn smartphones into high-quality cameras, such as the Sony QX100 ($500) and the Olympus Air 01 ($400). These both connect via Wi-Fi rather than a hardwired connection, however, and suffer a performance hit because of it. Nor is the hardware and software integration nearly as sophisticated as that of DxO One and its iOS app. You can use Android devices with the Sony and Olympus add-ons, however. The DxO One launched in June 2015 and remains current to this day. DxO has done an admirable job keeping the camera up-to-date with new features, such as the surprise Wi-Fi announcement. Since we initially completed our review, the company has also added Facebook Live support , which lets users live-stream from the DxO One camera and even switch between it and both the iPhone front and back-facing cameras for a mobile, multi-camera live broadcasting setup. In short, the DxO One is a capable camera that just keeps getting better, and we expect it will continue to improve for some time. That said, it is over two years old now and we have to imagine a replacement is in the works, although DxO has not announced one. While we still think the price is steep, we absolutely would not hesitate to recommend the DxO One to any enthusiast mobile photographer. It is the easiest and most compact way to boost the image quality of your iPhone. DSLR and mirrorless camera users will also appreciate it for those times when they simply don’t want to lug around their heavier gear. So yes, buy it if you can afford it. Update January 3, 2018: We spent some time with the latest version of the DxO One app, which added Facebook Live support, and have found it to work very well. Live-streaming performance and quality (at least on Wi-Fi) is very good, and switching between the three cameras (DxO One, iPhone front, iPhone back) happens instantaneously. You can go live with either with the camera plugged in to the phone, or wirelessly where you can use it to get a different angle from your phone’s camera. This is a great multi-camera live-streaming setup for anyone who needs to travel light, which should be particularly useful to citizen journalists.